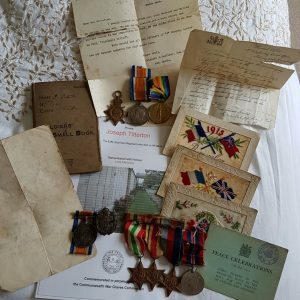 RARE Merchant Navy B.E.M. 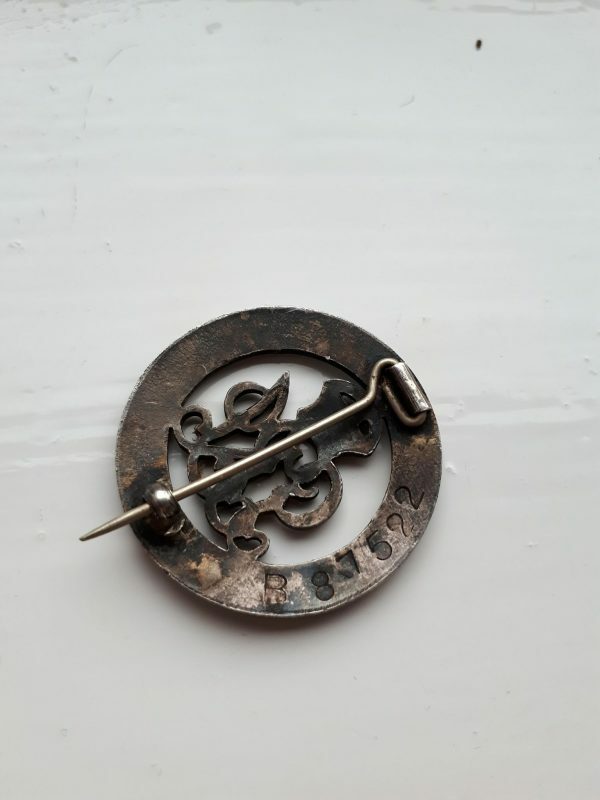 Group with WW1 Silver War Badge. British Empire Medal and WW2 Medal Group to a Russian born national later naturalised a British Citizen and Second World War Casualty Medal Group and Condolence Slip to his son, also named Christopher Osolin who died serving in the Durham Light Infantry in North Africa 1943. 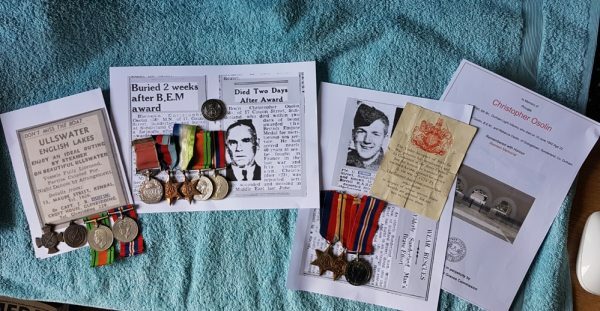 Plus 2 Royal Life Saving Society Medals named to a 3rd member of the family, and a further 2 medals to another family casualty. 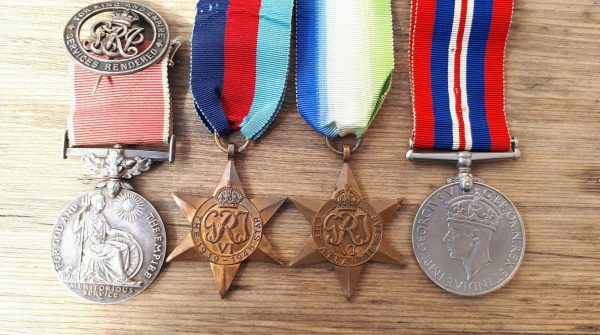 Father – British Empire Medal, named to CHRISTOPHER OSOLIN with Great War Silver War Badge along with 1939/45 Star, Atlantic Star and War Medal. 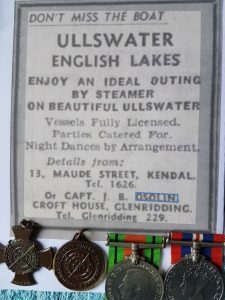 The Silver War Badge (B87522). Royal Life Saving Society Bronze Cross and a 3) Royal Life Saving Society Bronze Medal both named to J B OSOLIN JULY 1950. 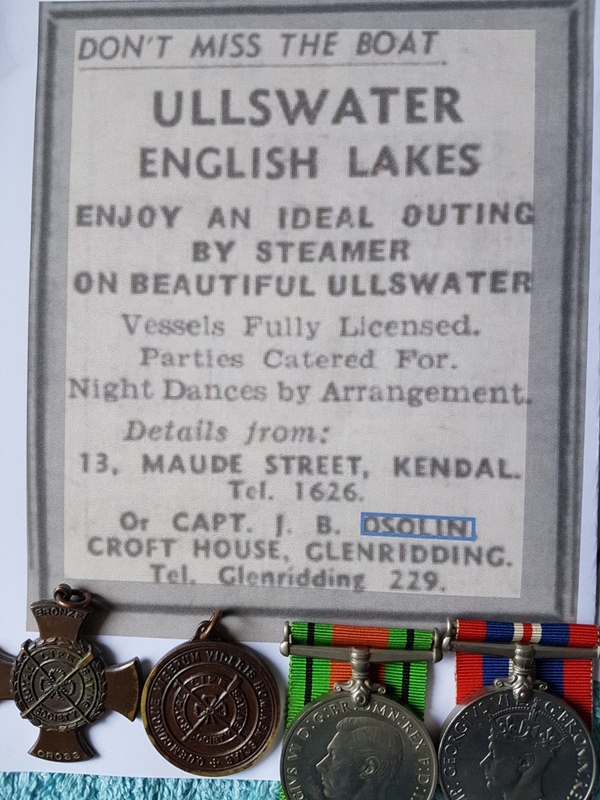 Defence and War Medals – attributed to Peter Osolin who drowned whilst serving with the East Yorkshire Regiment. 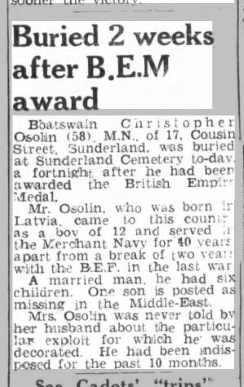 British Empire Medal award to Merchant Navy Boatswain Christopher Osolin announced in the London Gazette 4th January 1943. Christopher OSOLIN was born 24th July 1885, in, Riga, Latvia, Russia. Naturalised, Certificate Number 6071, date 22nd April 1920. He arrived in England as a young boy. 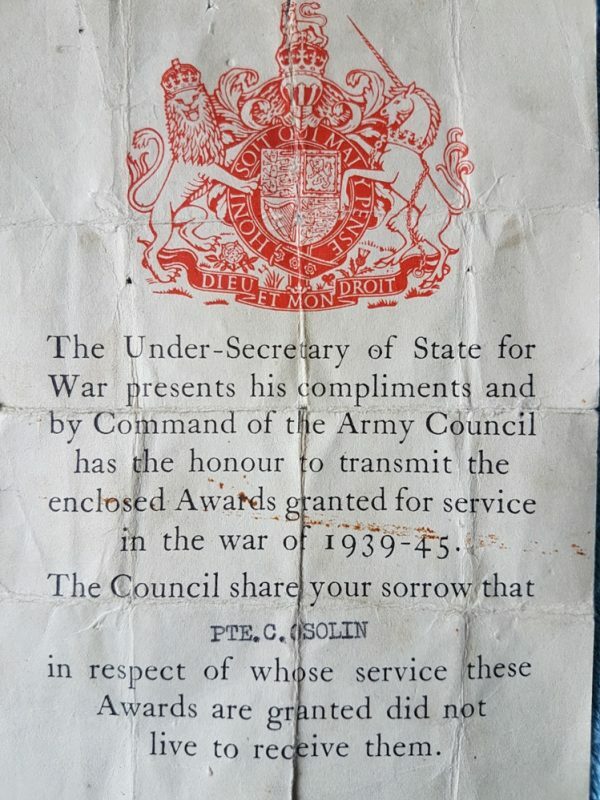 The Roll for the Silver War Badge confirms that it was awarded to Chris Osolin. He enlisted 26th September 1916. He was discharged Sick 30th November 1918. He had originally enlisted into the Durham Light Infantry and later transferred to the NCLC (Non Combattants’ Labour Corps.). His Index Card confirms that he was not awarded any medals. He served as Private 168475 and 29485. 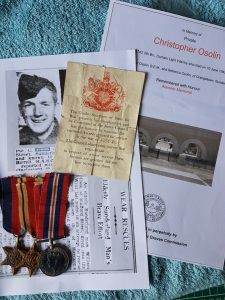 The service records for Christopher Osolin snr confirm that he suffered with the loss of 2 toes during the Great War and an injury to his elbow which impaired its use. Records show that Christopher Osolin served on the Merchant Navy ship S.S.CRACKSHOT during WW2 and there are numerous mentions of the activities of Crackshot in newspaper journals of the time. It is recorded that he kept he nature of his BEM award from his wife. Various newspaper extracts confirm that he lived at 17 Cousins Road, Sunderland. He had served in the Merchant Navy in excess of 40 years. He had 6 children, one of which Christopher was a Casualty in North Africa 1942 (see below). He had been ill for a long time before succumbing to illness. The medal was awarded by the King to his wife. He had died 2 weeks prior to the investiture. He was buried 2 weeks after the B.E.M. award. He died in 1943 aged 58 years following a prolonged illness. His service records also show that Rebecca and Christopher Osolin suffered the death an infant daughter, Katherine, aged 16 months in December 1918. 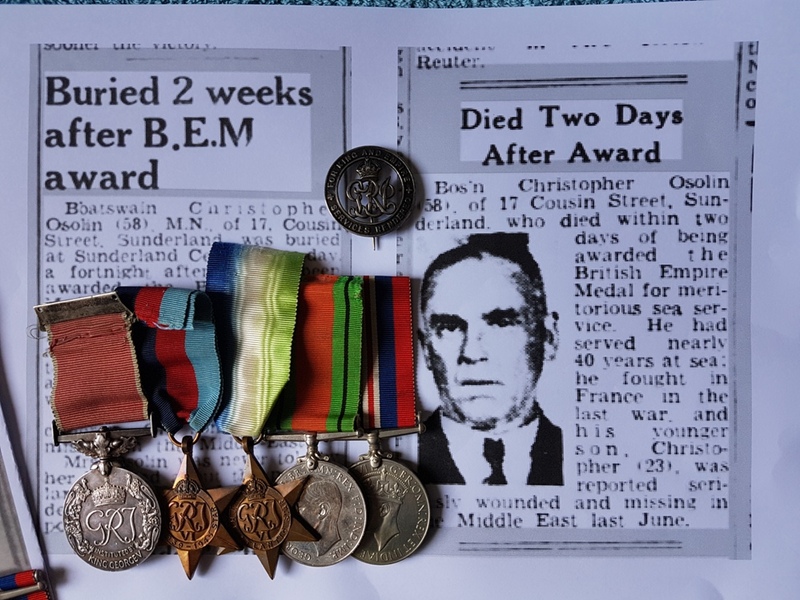 1939/45 Star, Africa Star, Defence Medal and War Medal along with his Condolence Slip. Alamein Memorial. 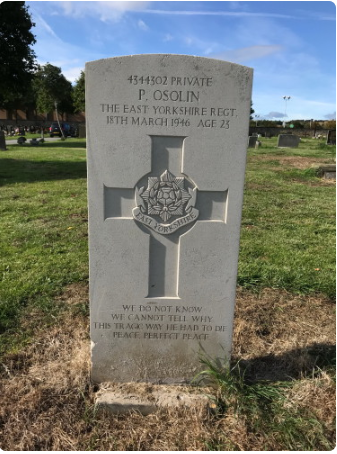 The CWGC Certificate confirms that he was the son of Christopher Osolin, B.E.M., and Rebecca Osolin, of Grangetown, Sunderland, Co. Durham. 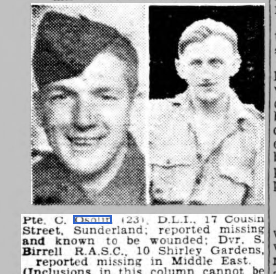 He was reported missing in the Sunderland Daily Echo and Shipping Gazette Friday 10th July 1942.
boy. Christopher Osolin junior was in a rowing boat on the river rescued them both. The boy who had been unconscious was revived. Also with these 2 groups are 2 Royal Life Saving Society Medals (1 Bronze Cross and 1 Bronze Medal). These are both named to J.B. OSOLIN JULY 1950. James B Osolin was born 1926 to Christopher and Rebecca Osolin (nee Blenkinsop) 11 years after they married in 1915. J. B. Osolin was Captain of Pleasure Cruises, Glenridding, Ullswater, Lake District. Attributed to Peter Osolin, see below notes. Margaret Hannah 18 yrs old. Believed to be a Daughter. Reported in the Sunderland Daily Echo and Shipping Gazette. Of Cousin Street, Sunderland. Sent to prison for 14 days for improper conduct. Olga, 19 years old. Believed to be a Daughter . 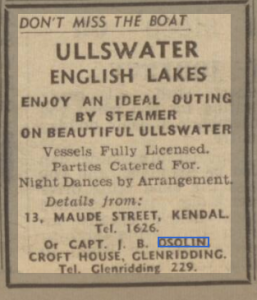 Reported in the Sunderland Daily Echo and Shipping Gazette, 3rd October 1941. Fined with a group of others for trespassing on the grass at Mowbray Park. It is noted that she was from Cousin Street, Sunderland. In the 1939 Census she was a Jam Factory Worker. Peter. Believed to be Nephew. 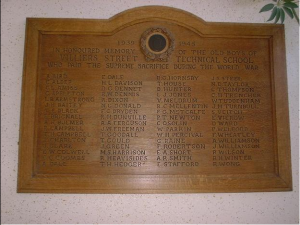 Died East Yorks Regt (Pte 434402) Died 18/03/1946 aged 23 years. Shown as Son of Joseph and Mary Armstrong of Humbledon, Sunderland. Buried SUNDERLAND (RYHOPE ROAD) CEMETERY. 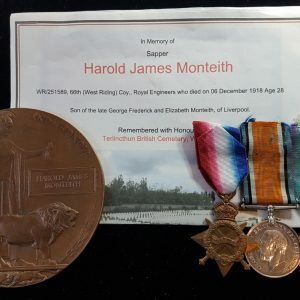 He had been found floating in the River Hull – found drowned. 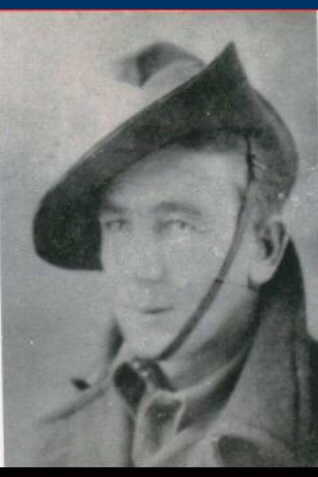 He had been stationed at Victoria Barracks, Beverley. The Doctor believed his body had been in the river for 2 weeks. Address given as 45 Peebles Road, Humbledon. 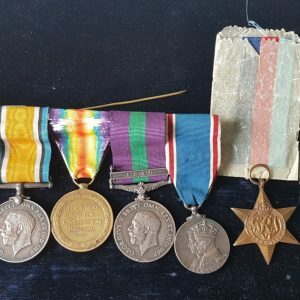 The unassigned Defence Medal and War Medal are believed to belong to Peter. 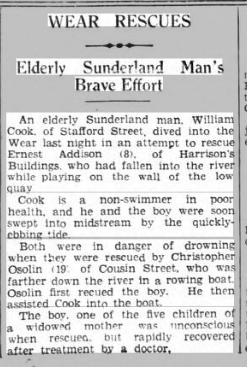 The following are extracts from Newspapers with articles about the Osolins of 17 Cousins Street, Sunderland. KEEP OFF THE GRASS Girls Fined at Sunderland Fines of 5s each were imposed at Sunderland Police Court to-day on eight youths and girls who were accused of trespassing on the grass in Mowbray Park. They were Jessie Abson (26). of Clifton, Yorks: William Oxlade (16), of Derwent Street: Joseph Bolden (17), of Falmouth Road: Thomas Haram (18). of Azalea Terrace South: Oswald Lloyd (18). of Stockton Road: Reginald Oxlade (20). of Derwent Street: Olga Osolin (19). of Cousin Street; and Ethel May Sinclair (17), of Hendon Road. P.C. Crystal said that on the afternoon of Sunday. September, he found a large number of young people, including some soldiers and sailors, sitting on the grass slopes above the bowling green. The parks foreman had told him that damage done by people sitting on the grass amounted to several pounds a year. The Chairman (Mr John Storey) told the defendants that they were spoiling the beauty of the place for other people. For loitering on the footpath and causing an obstruction at the corner of Whitehall Terrace and Fordham Road two 17-year-old youths. John William Goldsmith. Portland Road, and William G. Logan, of Fenton Square, and 15-year-old girl were fined 2s 6d each. 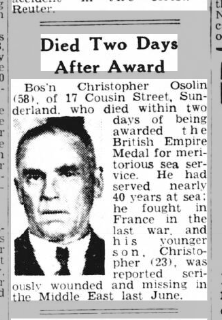 Buried 2 weeks after B.E.M award Boatswain Christopher Osolin (58). M.N. of 17, Cousin Street. Sunderland, was buried at Sunderland Cemetery to-day. 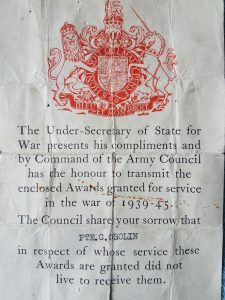 a fortnight after had been awarded the British Empire Medal. Mr. Osolin. 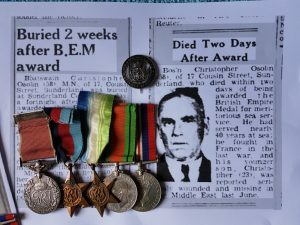 who was born came to this country as boy of 12 and served the Merchant Navy for years apart from a break of two years with the B.E.F. in the last war A married man. had six children. One son is posted as missing in the Middle-East. Mrs. Oso’.in was never told her husband about the particular exploit for which he was decorated He had been indisposed for the past 10 months. BOY’S ALLEGATION COURT QUERY ABOUT WORK AT INSTRUCTION CENTRE Questions regarding the work done at Prospect Row Junior Instruction Centre were asked the Chairman (Mr R. J. Wilson) at Sunderland Police Court today. following a statement made by boy that all he was asked to do at the centre each day was to take piston rings from a cylinder. Christopher Osolin (17), of Cousin Street, was accused of failing to attend the centre. The case was adjourned until to-morrow so that a representative from the school could attend to explain what training is given. Osolin was stated by the Superintendent Attendance Officer (Mr W. Tunstall) to have been given notice on May 27 to attend the centre. He attended irregularly until last September, since when he had not been at all. The boy had been interviewed and promised to attend, but had not kept this promise. “This a bad case of deliberate nonattendance for no reason, and the boy. whose father is at sea. is really out of hand.” commented Mr Tunstall. Mrs Osolin said the boy went to the Junior Technical School and had learned much more than at the instruction centre. The Magistrates’ Clerk (Mr F Morton Smith commented that the centre an important asset to the town, and was run by the Council. Mr Wilson: If this boy’s allegation is true he would not learn much. GIRL SENT TO PRISON Sunderland Magistrates to-day committed Margaret Hannah Osolin, (18), Cousin Street, to prison for 14 days for improper conduct. Sergeant Rouse took the girl into custody last night in South Street in consequent, complaints received Superintendent Cook said every effort had been made to help the girl When asked the Bench she declined to go into a home.